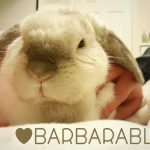 Barbara Rabbit here again! Check out my previous blogs if you haven’t already – I have some good things to say! Today I want to talk about a really important topic: how to make sure your humans keep healthy. As we rabbits know, managing our own health is hard enough. Lots of us have been bred to have very flat faces which can give us breathing or eye problems, we are very susceptible to GI stasis, sometimes washing can be tricky and that can lead to infection… The list goes on and on. Fortunately, there are lots of great rabbit vets out there who can help our humans take care of us. However, did you know that our humans can also get ill? And, as they take such good care of us, it’s only right that we return the favour! Personally, I like to sleep for at least 18 hours a day. I’m getting on in years a bit, and it’s important that I get my rest. I think that humans don’t sleep enough. It’s not always easy to make sure that they get lots of sleep, but there are definitely ways to encourage them. For example, my mummy is having a human baby. 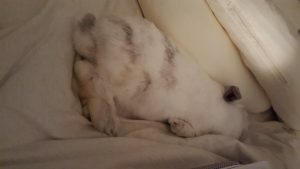 Pregnant rabbits should sleep a lot. So when I first realised what was going on, I made a real effort to lie on the bed with her to encourage her to sleep. I’d pretend to sleep next to her (okay, okay, sometimes I was actually sleeping!) and she’d usually drop off as well. As a bonus, human beds are usually ridiculously comfortable – have you ever tried one? 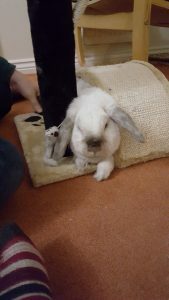 You might need to get them to lift you up there if you’re less mobile, but oh, the flopping possibilities – look how comfortable I am! But time your sleep right! You need a good balance of sleep time and play time, and humans don’t always understand where the boundaries lie. This morning, I noticed my daddy was sleeping when he really should have been awake. That’s okay – it’s my responsibility to make sure he gets up. I went to peer at him first, and then made some loud noises to ensure that he was definitely awake by the time I was done. I didn’t want him to miss out! After all, it was food time. My brother Ned sometimes takes a more extreme view on this and will hurl himself into the side of his cage or a wall to make a loud noise. His way looks more painful and I don’t think I want to try it. Thumping works just fine for me, thanks. Humans are quite clever, like us. That’s why I think it’s really important to challenge them sometimes. 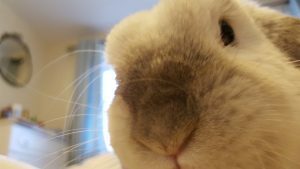 Everybun knows the usual tests we put in place for our humans: can I crawl under the bed, is this wire tasty, can I break free of the cage, etc.? But they’re getting wise to those, so we need to think up some new ones! I’ll share a fun one I tried a few months ago. My brother Gingee had a cat tree that he used to climb up. We were running round the room and I decided I’d try something new. I tried to squeeze between two parts of it and wedged myself in there. My daddy had to get out his tools and unscrew it completely to set me free! What a great problem-solving opportunity! Don’t neglect their mental health! Remember, stroking a furry friend is very important for humans. It can keep their blood pressure down and make them feel less stressed and depressed. I don’t mean you have to give them free access to you at all times, obviously. I just mean that you need to keep an eye on them, and sometimes know that it’s particularly urgent that they give you a head rub. Those are the times you need to pester them. If they don’t do it of their own accord, nudge at them with your head, put your face in front of theirs, or maybe nibble at them a little bit. Even if it takes a slightly painful nip, you’re doing this for their health. It’s very important! Are you already doing any of these? If you’re not, I hope you start soon! Remember, your humans are depending on you to remind them to keep healthy! Until next time, my furry friends.